Sihi means sweet in Kannada. No, this kootu (curry) is not sweet literally but it refers to the inherent sweetness of the coconut and moong dal used in its preparation. It's a mild preparation with the minimal use of spices so that the true flavours of the original ingredients stand out. It is a super healthy dish with proteins, vegetables and coconut all cooked together in minimal oil. As I have been documenting recipes on my blog all this while, it struck me that I need to document all the traditional recipes used by my grandmother before they are long forgotten. My paternal grandmother used to follow the Madhwa Brahmin Kannadiga style of cooking. However, it was heavily influenced by the palate of the neighbouring temple town of Kumbakonam in Tamilnadu from where my grandfather belonged. To add to this diversity, my grandfather migrated to Mumbai for work. I was born and brought up in the suburbs of Mumbai. My mother is from the western state of Goa and my husband is a Kokanastha Bramhin from Gujarat. So, one can imagine the diverse tastes I have developed over all these years. I will definitely add some traditional dishes I have learnt from the other regions as well. In a pressure cooker, heat the oil and temper it with mustard seeds, curry leaves and hing. To it, add the ground coconut paste and fry it nicely for 3-4 minutes on a moderate flame. To this add the finely chopped vegetable of your choice. I have used green beans in the pic above. Add the moong dal, tomato and water and allow it to pressure cook for 5 minutes. I usually keep the flame on sim and allow it to cook for 5-10 minutes till the dal gets cooked. Allow the pressure cooker to cool before opening the lid. 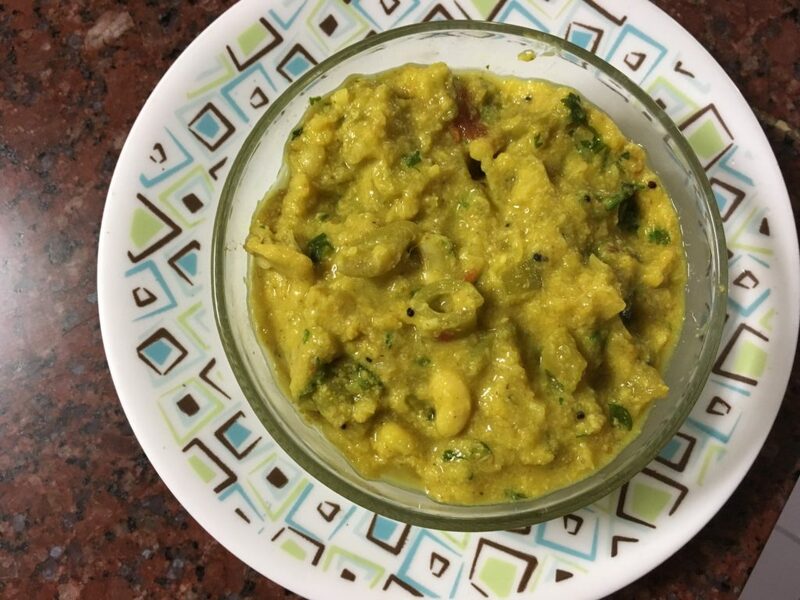 Garnish it with coriander and serve it with rice or roti. For better results, the tempering (of oil, mustard seeds, hing and curry leaves) can be added to the dish after it has been cooked. In such a case, one can start with frying the ground coconut paste in little oil and proceeding as mentioned above.